Elk country varies from wide open prairie to dense underbrush, and hiding varies somewhat for every type of terrain, but not as much as you might think. There is more in common than different. Camouflage clothing should match the country being hunted. In the forest everything from ultra complicated modern camo to military issue works fine. Try to match your colors to the common features of the underbrush. Face paint or masks should be used whenever you are close to elk. White faces glow like a neon sign. Use the terrain to get close to elk. Even when elk are coming in, the terrain can be used to your advantage. Hiding close to the curve of a ridge or other terrain feature often means the elk will be close before they have a chance to see you. If you are calling by yourself this can be a deal maker! Elk will almost always stop coming in when they should be able to see other elk, at least to check out the situation. If that happens to be at 10 yards, WHACK. Pick your hiding spot quickly and carefully. The place you chose to stand is critical. If you bury yourself in the bushes, you won’t be able to shoot. If there aren’t enough bushes to break your visual form, you’ll be busted. Standing or kneeling partially concealed by brush with a tree or stump close behind you is a good bet. Hide in the shadows instead of in direct sunlight if you can. 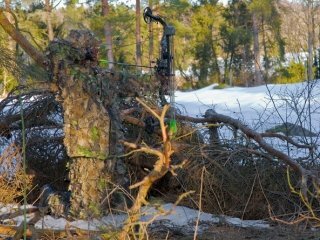 Once you hide, plan where you will be able to draw your bow when the elk is approaching. If you’re undetected but haven’t drawn your bow in time, it spoils the show. Once you pick your spot move as little as possible. When the elk are close, don’t move at all! Trust your camouflage and hold your bow so that it further breaks your form. It can be nerve racking up close to elk, but you’ve got to wait for the right shot. I have spent half an hour within 40 yards of three bulls, each bull looked directly at me many times and never picked me out. Eventually the largest bull cleared the brush, success was due to a good wind and trusting the camo!